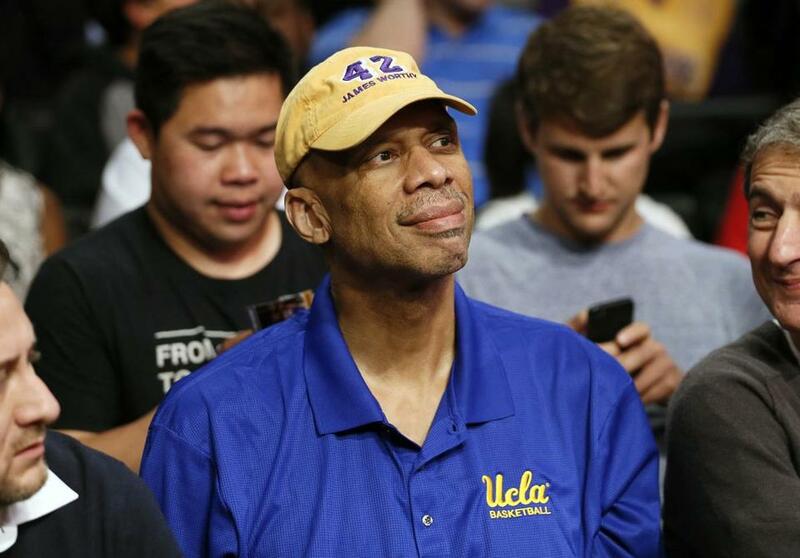 Kareem Abdul-Jabbar, at a Lakers game April 1, is recovering from quadruple coronary bypass surgery. Basketball Hall of Famer Kareem Abdul-Jabbar was recovering Friday after undergoing quadruple coronary bypass surgery. He had the surgery Thursday at UCLA Medical Center in Los Angeles. Dr. Richard Shemin, who performed the surgery, said the 68-year-old former NBA and UCLA star is expected to make a full recovery. Abdul-Jabbar is the NBA’s all-time leading scorer with 38,387 points during a 20-year career with the Lakers and Bucks that ended in 1989 . . . At the NBA Board of Governors meeting in New York, owners held their first discussions about the playoff format. Two teams in the East — the Celtics and Nets — finished below .500, renewing calls to make the playoffs for the best 16 teams, instead of the top eight in each conference. Also, the owners were advised that the league’s salary cap could rise past $100 million by the 2017-18 season, according to an ESPN report. The cap is currently at $63.1 million. Blue Jays shortstop Jose Reyes has a cracked rib on his left side and will miss this weekend’s series against Atlanta. Reyes won’t play again until at least Tuesday against Baltimore. Reyes believes he got hurt on a check swing last Friday against Baltimore. He said an MRI this week revealed the cracked rib and a strained muscle . . . Nationals righthanded reliever Craig Stammen will have surgery Sunday for a torn flexor tendon in his right forearm and could miss the rest of the season . . . All-Star outfielder Carlos Gomez was placed on the 15-day disabled list by the Brewers because of a strained right hamstring . . . The Twins placed lefthander Brian Duensing on the 15-day disabled list with strained muscles in his rib cage . . . The Dodgers claimed righthander Daniel Corcino off waivers from the Reds. Michael Phelps failed to qualify for the 400-meter freestyle final in a meet at Mesa, Ariz., on Friday, finishing 17th overall in his first competition since serving a six-month suspension for a second drunken driving arrest. Swimming in a far outside lane, the 18-time Olympic gold medalist was fourth in his heat with a time of 4 minutes, 2.67 seconds. On Saturday, he’ll compete in the 200 individual medley and 100 freestyle . . . Adam Peaty of Britain broke the men’s 100-meter breaststroke world record, clocking 57.92 seconds at the British championships at the London Aquatic Centre. The 20-year-old surpassed the previous record of 58.46 set by South African Cameron van der Burgh in the same venue at the 2012 Olympics. Matt Kenseth will try for his first win since 2013 when he starts from the pole at Bristol (Tenn.) Motor Speedway. Kenseth turned a lap at 128.632 miles per hour to grab the top spot. Kenseth is winless in 51 races since New Hampshire in September 2013. Brad Keselowski qualified second at 128.442. He was followed by Carl Edwards . . . Sacha Kljestan and Mike Grella scored first-half goals to lead the host New York Red Bulls to a 2-0 MLS victory over the San Jose Earthquakes . . . Keith Pelley, president of Rogers Media in Toronto, was named commissioner of the European PGA Tour.